Yesterday we talked about calendars and how we use them, so today I thought I would share with you how we put together a project. It’s all about getting things done. Here are Marketing for Owners, that is what we talk about. We don’t just share marketing and sales tips, but we talk about implementing and getting things done. We love sharing tips on how to make your life more smoother and stress free, all the while being more productive and effective. This will also give you more time to relax. 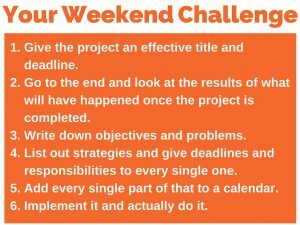 Every Friday, I give you a weekend challenge, and if you want to do more of these, you can visit here. This just gives you something to do over a period of a week or a weekend that you can do to help your business grow and move further. 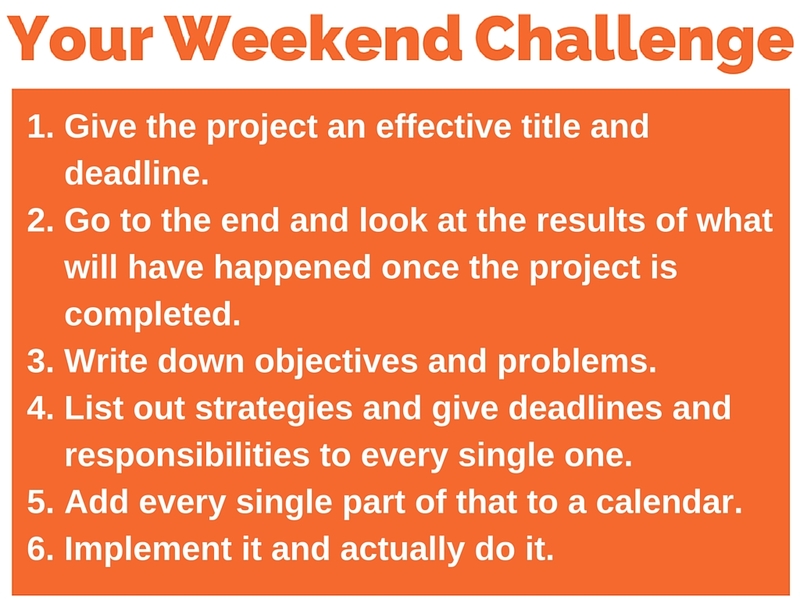 So, your challenge this weekend is a project. Now, lots of people talk about starting a project, but what does it involve. Today, I am going to share with you our process here at Marketing for Owners for getting a project off the ground and running. In my Fire Protection Online Business, there are 12-15 staff members who help get those projects done. Now, when it comes to the project, there are about 2 or 3 of us sitting around deciding on what project to start with. If you have too many people, you get too much interference. So — here is how to get it accomplished in a smooth and orderly fashion. If you don’t have a deadline, then it is never going to get completed. Look at the end of the project to see what it will look like once all the steps have been completed. Look at how it contributes to the future, how it is going to help, etc. How are you doing on this project? How will you feel when it is completed? You need to start here, it is very important. It reiterates in your mind and it explains all the worthwhile reasons of why you did it. Then, go back and list all of the obstacles of why this just can’t be done now, or why isn’t it happening now? For example, our one project could be to design a 3 month email marketing system. One of the reasons it wasn’t being done is because we didn’t have an in house writer. So, we would write down the objectives and problems the, what is missing, what don’t we have now problems. Then against those, we write down each of the strategies or steps that is needed to fix it. So for instance, with what I mentioned above — we didn’t have an in house writer. The strategy would be to hire an in house writer. It’s as simple as that. So go through those and write down every single obstacle and you might find that the main reason it is not getting done is lack of ability in the company, or lack of training. It could be a lack of resources, such as a piece of machinery or equipment you don’t have — write that down. And the answer is to get one if that is what is needed for the project. Don’t block it and say, “Oh we could never have that”. Don’t say this will never happen. You have got to work around another strategy to figure that out. Take each one of those strategies and list them out on paper. Then, assign responsibilities to your staff for each one and give them each a deadline. Be sure to do this with every single task or strategy on that list. Some of these tasks cannot be completed until the previous task in the project gets completed. For example, if you were creating that 3 month email marketing campaign, one of the steps would have been to edit the emails. Now, an email cannot be edited until it is written. It cannot be uploaded until it has been written and edited. So some things come in an order. It doesn’t matter what order you write these down in, but write down the deadline and the structure. Then, like I said, you just decide who is responsible for seeing it completed — your self, your colleague, or one of your staff members. For example, when we set out the email strategy, we decided it would take 2 weeks to create 3 months worth of emails. We decided to allocate a maximum of one hour per day to this task. So between 11 and 12 each day, for two weeks, we slotted in something to be done. Now some of these things that make these happen, could be being done while a writer is writing the emails. While the writer is creating the text, someone else is creating images for those emails, so some thing can be done concurrently by different people. In a calendar, we decide that these things are going to be done at certain times of the day, it’s going to take this long, and it’s going to be done by then. Figure this out for your project. 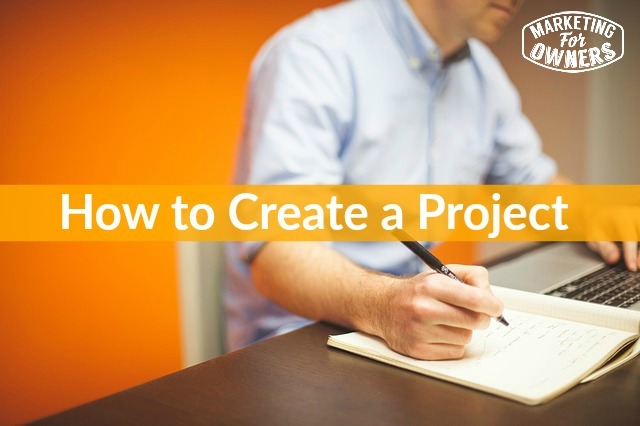 If your project is huge, and it is going to take you months and months to complete, you are probably going to need to break this down into smaller projects, and make them sub projects of the larger one. If it has too many working parts, then this project will never happen. Something will happen and everyone will blame everyone else and no one will be keen to do one of your projects ever again because it is never well organized. So get that in a calendar and make someone overall responsible — perhaps it’s you or someone on your staff — but make them a project manager. Get the project started, stick to the deadlines and keep a check on it. Be sure to keep a project diary where you keep reports of how it’s going. Be sure to have your staff who are working on it to check in with you and let you know how it is going. Now, this is a simple process for running every single project that you do. It doesn’t matter how small or how large the project it, it will fit into this simple template. Try to do 3 projects per quarter that take you toward your goal and by the end of the year you will have 12 and that is how we build our businesses. It call comes down to calendars and projects and planning. Have a fabulous weekend and enjoy yourself! I will chat with you more on Monday.